In CRM 2013 Microsoft released a really great feature – OOB integration with BingMaps. Unfortunately, the list of entities that support BingMaps control is limited to Account, Contact, Lead, Quote, Order, Invoice, Competitor, and System User. 1. Create field for your entity that will be used for storing addresses (in my case I’ve created custom field slick_address). 8. Save the Xml and pack it back to archive with the solution. 9. 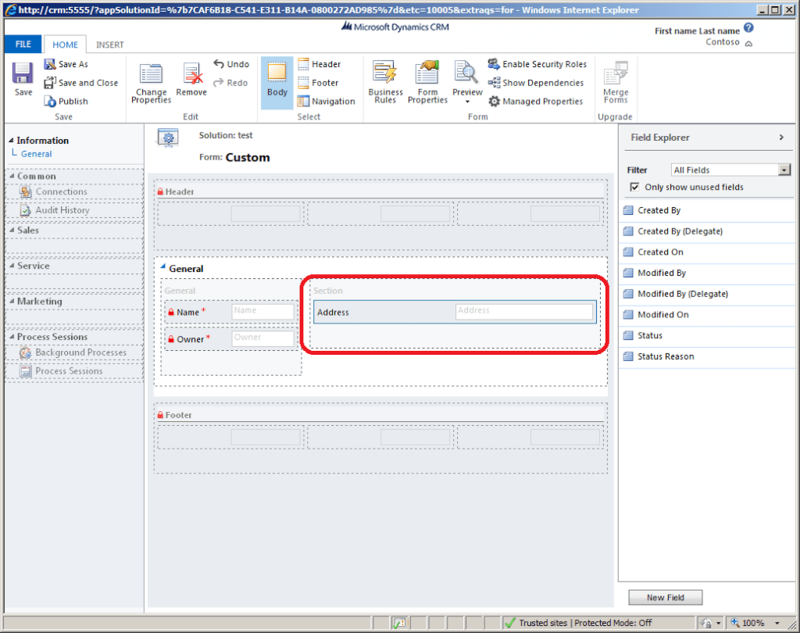 Import Solution into CRM and publish the changes. How to generate GUID used for ClassId and CellId for mapcontrol control, shouldn’t it be unique according to the product(CRM)? I have a question. How can I (via script more likely) refresh this control? I mean I have it in account but I load some scripts there before address is loaded and the Map doesn’t find the address by the time it searches for it, therefore I would need to force a refresh call on the map, how can I do such as thing? I have a better idea, i think. You can try putting the map in a subrgid on the form and use a web resource to refresh the subgrid on click on a button (you can add a html WR for this) or page/field events. I have some doubts. OOB bing map works on composite address. If I put only address as parameter, maps will miss city, postal code, country… Can I add these fields also as parameters, or I should join all these fields into one? As a possible workaround you can create a field that will be populated with City, Country, Street concatenated. After that you can use that field as a source for BingMap control.